Need a gift for that favorite neighbor, the girl scout troupe leader, a special teacher or a sports-minded brother-in-law? Here's my answer to the "what-to-give-them?" conundrum: Pillowcases. 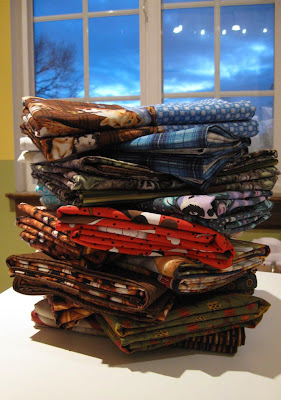 A menagerie of pillowcases for holiday gift-giving. 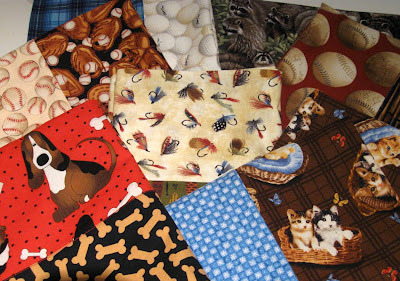 With all the colorful, fun and fanciful novelty fabrics available at your local quilt shop, pillowcases can be personalized with just about any motif or theme you can think of. Or pick a pretty floral, a wild geometric or a funky stripe… any of the quilt shop quality 100% cotton fabrics will wash up nicely and be soft to sleep on. Novelty fabrics for pillowcases—choose a theme. 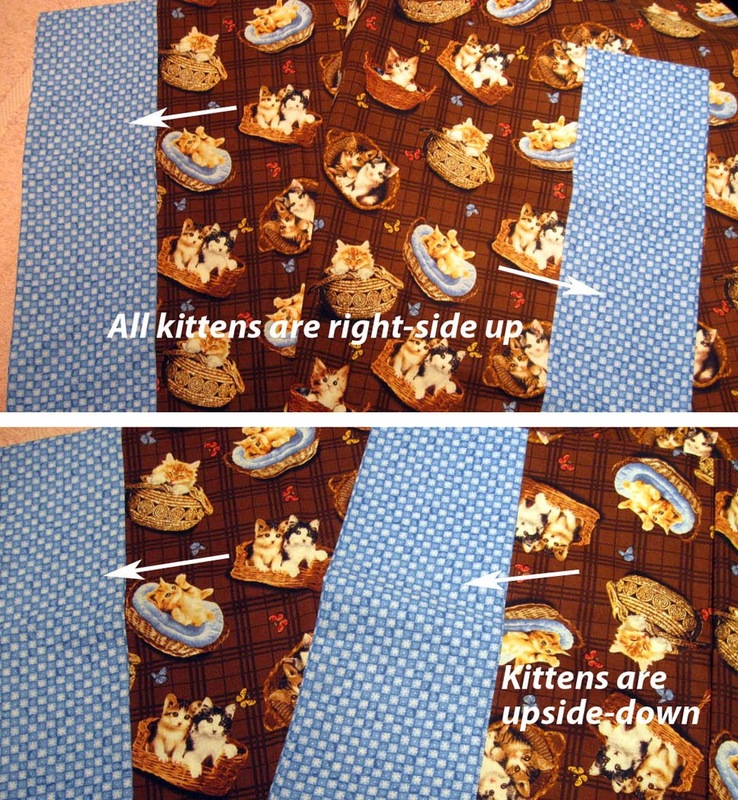 My original pillowcase tutorial is posted here. But recently, I discovered the "magical burrito pillowcase" method on Twiddletails blog that uses French seams and is a pretty cool technique. (I think we even had a guild program on this once upon a time.) You might give this method a try. Each pillowcase in the set has its opening and band on an opposing side. Note: If you're working with a directional print, however, you'll want to pay attention to which side of the body you attach the pillowcase band. I like a set of cases in which each case has the band opening are on the opposite side. 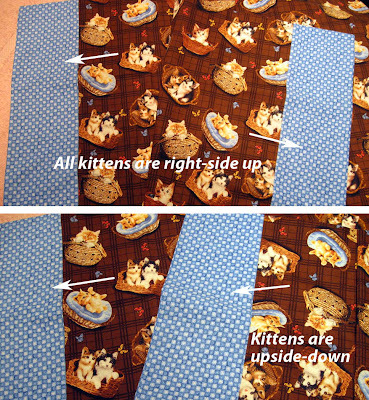 When the pillows are placed side by side, the bands fall to the outside of the bed and the motifs on the pillowcases are in the correct orientation (no upside-down kitties). My two new kitty pillowcases. An antique pinwheel quilt hangs in the background. 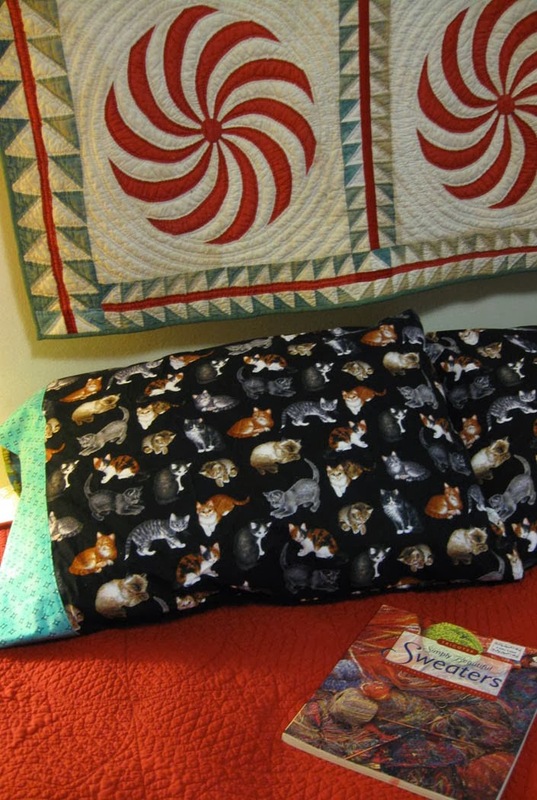 However you decide to sew them, custom designed pillowcases are thoughtful gifts. They can't help but make you smile and the recipient will think of you every night as they drift off to dreamland. And don't forget to make a set for yourself! I had to test drive the burrito pillowcase method on these kitty cases… which are now on my bed. Thank you Leslie for a great tutorial. I made 2 of these out of princess fabric for my 4 year old and 2.5 year old nieces. They are visiting next week and I wanted something special for them. These were perfect. I am a seasoned quilter, but never made pillowcases before. The directions were so easy to follow and I made both cases in less than an hour. Thanks again!